One day, Óðin staked his head on a wager with the giant Hrungnir that his horse Sleipnir was faster than the giant's horse, Gullfaxi. The ensuing race became so spirited that Hrungnir unexpectedly found himself within the walls of Ásgarð, and a long way from home. 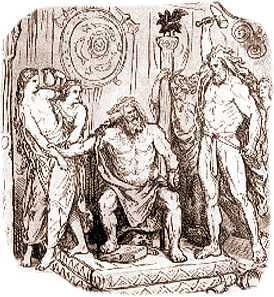 Óðin invited the giant into his hall Valhöll, to enjoy the hospitality of the gods. Hrungnir became drunk and abusive of the hospitality of the Æsir. 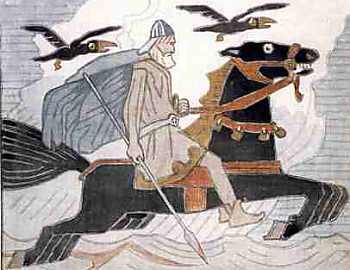 He boasted that he would kill all the Æsir, then bury Ásgarð and take Valhöll with him back to Jötenheim, along with Freyja and Síf. As if that wasn't bad enough, Hrungnir also declared he was going to drink all of the Æsir's ale. Tired of Hrungnir's boasting, the gods called on Þór. He arrived and was outraged to find a giant drinking with the gods. Unarmed, and thus unable to fight at the moment, Hrungnir challenged Þór to a duel, to take place on the border between Ásgarð and Jötenheim. No one had ever challenged Þór before. The giants, realizing the importance of the duel, decided to make a man of clay so large that Þór would quake at the sight of it. However, they could find no heart for the clay giant, so they used one from a mare. Hrungnir, on the other hand, had a heart of stone, a head of stone, a shield of stone, and for a weapon, he carried a whetstone, ready to be hurled. Þór and his servant, Þjálfi, arrived at the field where the duel was to take place. Þjálfi tricked Hrungnir by calling out that Þór was coming at him from below, underground. Hrungnir laid his shield on the ground and stood on it. 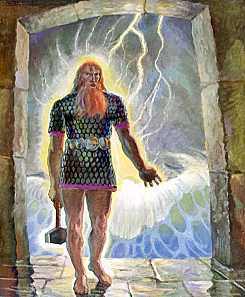 At that moment, Þór hurled Mjöllnir at the giant. Hrungnir saw the hammer flying towards him and hurled his whetstone at the hammer. The hammer and the whetstone met in midair One piece flew to Miðgarð, where it is the source of all the whetstone found to this day. Another piece lodged itself in Þór's forehead, and Þór fell. But Mjöllnir hit its mark, crushing Hrungnir's skull. He fell to the ground dead. One of his massive legs pinned Þór's neck to the ground. Meanwhile, Þjálfi attacked the clay giant. The giant was so terrified that he wet himself. Þjálfi hacked away the giant's legs, and he fell with little glory. Þjálfi tried to free Þór's neck but was unable to move the Hrungnir's leg. Even the Æsir were not strong enough to move the dead giant's leg off of Þór's neck. Finally, Magni, Þór's three year old son, accomplished the task. Þór was so grateful that he gave Hrungnir's horse, Gullfaxi, to Magni, despite Óðin's protest that he should receive the horse. Back in Ásgarð, the whetstone remained stuck in Þór's forehead. He sent to Miðgarð for the sorceress, Groa, who chanted her magic charms over Þór. The whetstone began to work loose and the pain diminished. Þór was so grateful that he told Groa the happy news that her long lost husband, Aurvandill, was not dead. Þór had carried him back across a river in a basket, but his toe had stuck out of the basket and gotten frozen. Þór broke it off and threw it up in the sky as a star. Þór told Groa that her husband would be returning home soon. She was so overtaken with joy that she could not remember the rest of the magic that would have completely removed the whetstone. So the stone remains lodged in Þór's head. 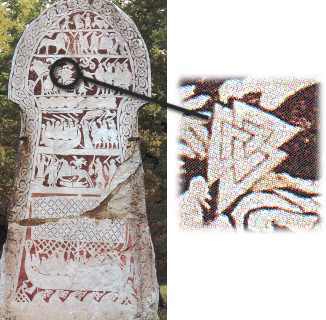 Hrungnir's heart of stone is described as having a particular spiky three-pointed design. Similar designs appear on old Norse picture stones (such as the one to the right in Gotland) and are called Hrungnir's heart. To liken a Norseman to any aspect of a mare was a mortal insult. To say that a Norseman had a heart of a mare was even worse, since the heart was the seat of courage. So the clay giant with the heart of a mare was a pushover for Þjálfi. Auravandils tá (Auravandil's toe) is one of the few Norse star names known today. It is not known what star it is. One should not throw a whetstone, because doing so makes the whetstone in Þór's head move, causing him discomfort.